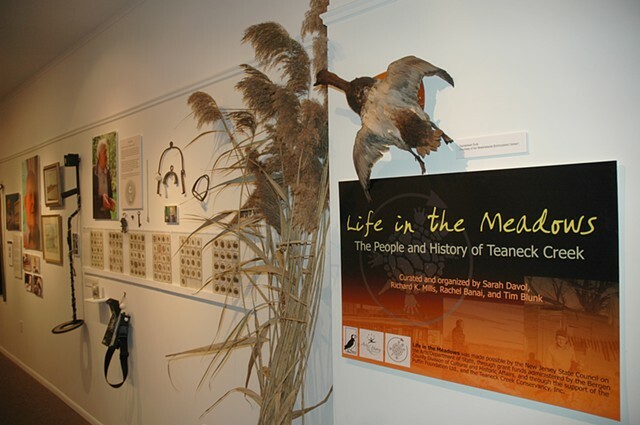 Photographic portraits, oral history, artwork, and artifacts documenting the inhabitants of the environs of Teaneck Creek and the NJ Meadows. Curated and organized by Tim Blunk with Rachel Banai, Sarah Davol, and Richard Kirk Mills. This project was supported by a grant from the Bergen County Division of Cultural & Historic Affairs. Composer and musician Sarah Davol and artist Richard Kirk Mills facilitated the participation of neighborhood residents in the taking of their portraits and telling of their families’ histories for Life in the Meadows. Rachel Banai and her students made the portraits of local Meadowlands residents at the Conservancy. Other subjects and family artifacts were photographed by Ms. Banai, Richard Mills, and Tim Blunk in their homes. Sound recordings were made of the subjects’ stories and family folklore by Mills and Davol. In the very successful exhibition, the subjects’ portraits were grouped with family artifacts, photos, and stories in “shrines” that illuminate and celebrate each family’s history. Distinguished longtime Meadowlands resident John R. Quinn, artist and author of Fields of Sun and Grass: An Artist’s Journal of the New Jersey Meadowlands. lead a walk and talk at the Conservancy.